Blood-brain barrier breakdown. Confocal light micrograph of a section through the brain showing a breakdown in the blood-brain barrier. 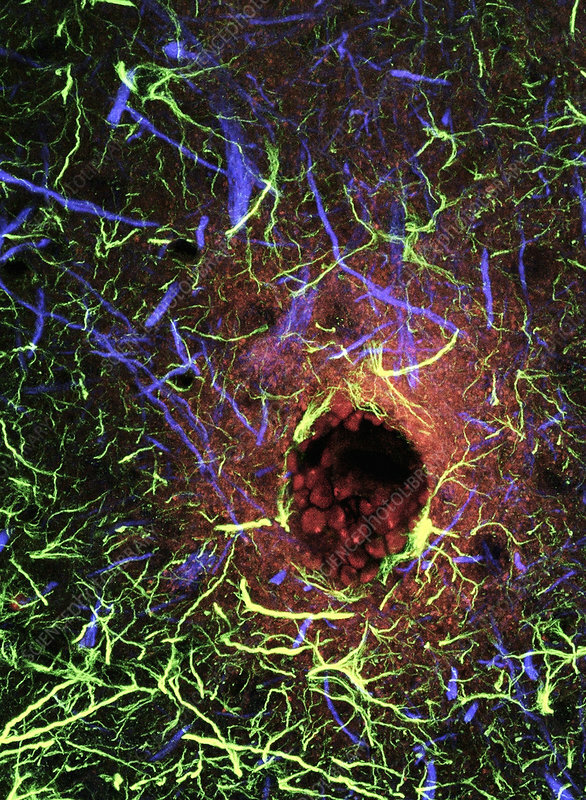 A fluorescent tracer (red) has been injected into the blood and is leaking from the blood vessel at lower right (round) into the surrounding brain tissue. The barrier, which consists of tightly packed endothelial cells, protects the brain from potentially harmful molecules and micro-organisms. If it is breached, by injury or disease, it can lead to the death of the surrounding tissue. Within the brain tissue, neurons (nerve cells, blue) and glial cells (support cell, green) are seen. Glial cells provide structural support, nutrients and oxygen for neurons, and are also thought to help maintain the blood-brain barrier.